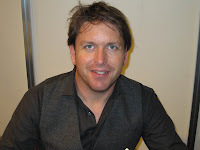 I was lucky enough to meet James Martin this weekend and the Hairy Bikers but I have to say that I am a huge James Martin fan and had to share this lovely photo of him, I even shook his hand when he signed my book for me, loads to scrapbook from the weeknd and no time to do it! Lucky Bags are now on sale and all the bags have a little voucher in and who knows you might be lucky enough to have one of the £100 vouchers. I am trying to get the Christmas Crop organised but it has a twist and will be in January (so something to look forward to after Christmas) but with loads of party games and other fun stuff, just waiting on the date being confirmed by the lady who runs the village hall. Big News - keep your diaries clear for May, Melodee and A.N. Other (to be confirmed) along with 1st year anniversary celebrations all to look forward to, don't forget that your completed loyalty cards go into the prize draw to win an electronic die cutting machine and loads of other prizes, which will be drawn on 31st May 2010. Looking forward to your Christmas crop in January,something to look forward to in the winter months.